The Mies van der Rohe Society recently partnered with the Chicago Architecture Biennial to co-present Theatre, a site-specific installation and series of performances by the internationally acclaimed Mexico City-based artist Santiago Borja. Debuting in conjunction with the opening of the Biennial, the program took place in Mies van der Rohe's recently restored Robert F. Carr Chapel, “ the God Box”, on the campus of the Illinois Institute of Technology. I had the good fortune to be in Chicago, recruiting, during the run of Theatre, and for the opening of the Biennial. At the suggestion of Alum Sarah Rogers Morris, one of the founding members of our Chicago Chapter, a group of Bard Graduate Center Chicago alums and I were in attendance on Oct. 2. It was a remarkable evening, a great performance, and a wonderful experience for us all. The chapel is the only religious building Mies ever designed, and is an enormously powerful, spiritual space. The materials of the large room, steel, wood, brick, glass, wool, stone, all seem to be in dialogue with each other, and one almost senses Mies himself involved in the conversation. The man who wrapped us all in glass asking us all to consider the inter-connectedness of multiple materials. The performance itself was the idea of Mexican artist Santiago Borja, whose recent work centers on the intersection between art, architecture, and anthropology. 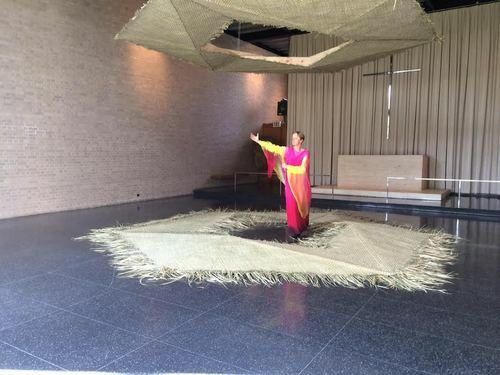 And the Carr Chapel provided him with a perfect site specific space for exploring the notion of the sacred – from the ancient invocation of priestliness to the high modern, deeply mediatative. A grand opening to the Chicago Architecture Biennial, and a wonderful experience for Bard Graduate Center colleagues to share! 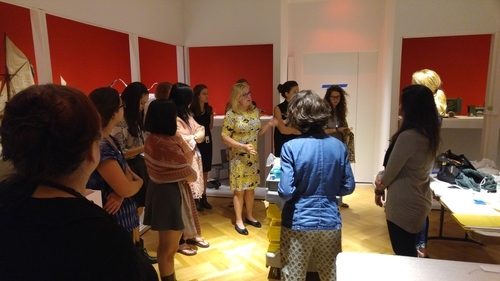 On September 10, Founder and Director Susan Weber led students and staff in an installation workshop, for Swedish Wooden Toys, even as Associate Gallery Director Ian Sullivan and his team were finishing up the install for this magical and well-received exhibition. 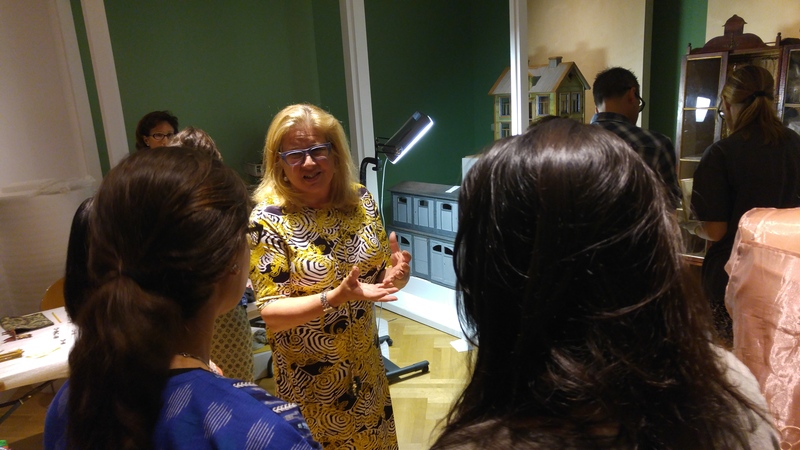 Swedish Wooden Toys opened to the public on Friday, September 18th. These installation workshops have become a regular event for most main gallery exhibitions, and are looked forward to by all – providing an important “behind the scenes” look at exhibition making. In this session, the galleries were filled with joyful sights of childhood, as the antique toys showed off the crafts and skills of early toymakers, from early hand-carved small animals to the iconic images of Swedish childhood : beautifully painted horses, rocking animals, cars, trains, and spectacular doll houses. The exhibition will be up throughout the fall , and provides wonder and instruction to children and adults of all ages. Bard Grad Center invites you to take a walk through what will undoubtedly be a world of memories for many – whether you played with toys like this yourself, or not. Swedish Wooden Toys is a gateway to the world of childhood. If it is September, it is the time for Bard Grad Center Grad School Fairs, Information sessions and Open Houses! This year my colleague Keith Condon and I will be doing a lot of school visits — so if you think you might be interested in learning more about our academic programs, check our list, below, and try to stop by one of the fairs, or the Open Houses that we are hosting. Here is our schedule so far. We'll be adding more stops, so check our website as the fall progresses….. I look forward to meeting and talking to you! Here's our schedule so far….
" 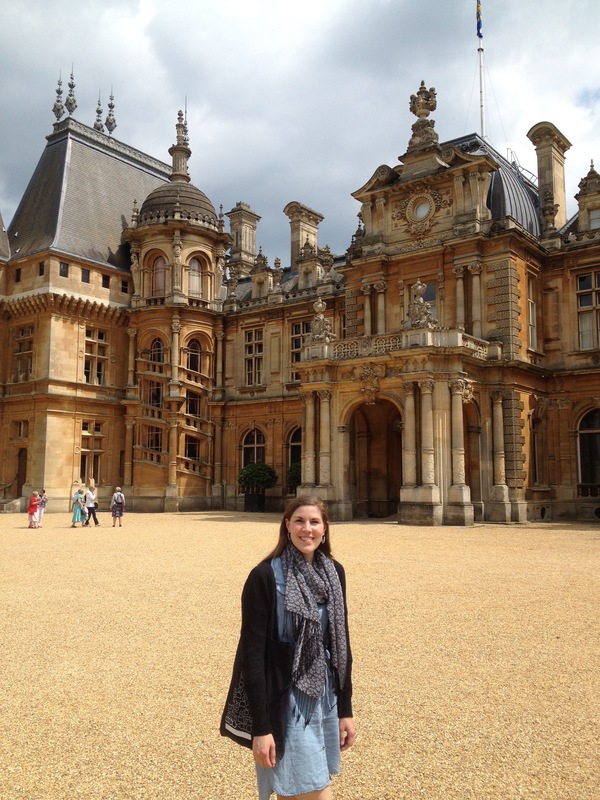 I was very lucky to spend the summer living on the grounds and working as an intern in the Collections (Curatorial) Department at Waddesdon Manor in Buckinghamshire, UK. Waddesdon is unique in that it is both a carefully preserved historic estate, largely furnished as it was in the late nineteenth century, when the Manor was built by Baron Ferdinand de Rothschild, and is the repository of a museum-quality collection of decorative and fine art objects, collected over the last century by various members of the storied family. My work centered on Manor's extensive drawings and prints collection. Along with one of the assistant curators, I inventoried and catalogued some eight hundred works on paper, many of which related to architectural and ornamental designs. The inventory project dovetailed with my research for an upcoming drawings exhibition that will highlight the collection's significant works by two critical figures in French Rococo design: Juste-Aurèle Meissonnier and Gilles-Marie Oppenord. 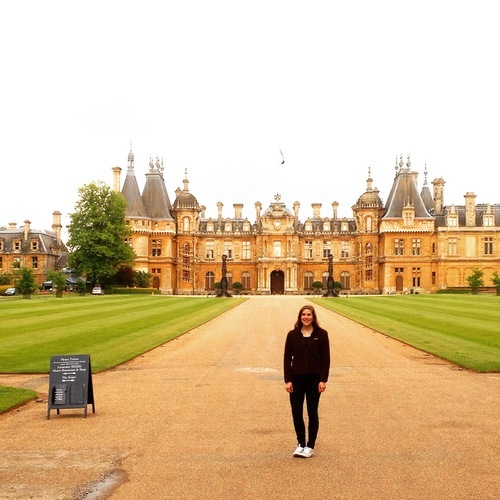 It was a privilege to learn from and work closely with Waddesdon's Collection Department and I could not help but wish the summer would last longer. " 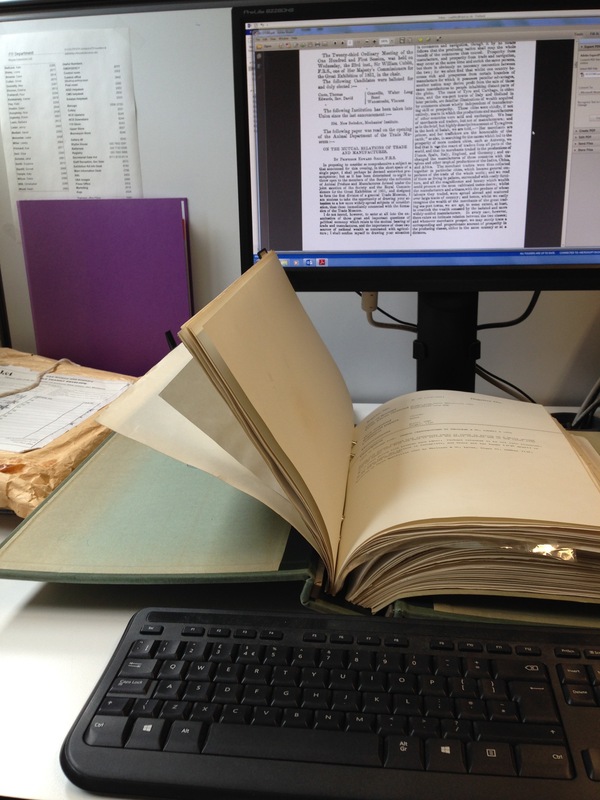 I also spent time working on a digitization project that involved uploading just over 1,500 photographs of textiles classified as “animal products” during the late-nineteenth century to the museum’s internal database. Through this process, the images were also published to the V&A website’s Search the Collections feature for the first time. While it required a great deal of patience and careful attention to detail, it also enabled me to collaborate with colleagues across two museum departments and institutions providing an opportunity to engage what I have learned about textiles at the BGC and explore a dynamic intersection between fashion, science and museum studies that I had not previously considered. Meetings and conversations with fashion curators Edwina Ehrman and Jenny Lister brought the images on my computer screen to life. From their work, I learned that around eight-hundred objects of the original Animal Products Collection, which the museum acquired as a result of the Great Exhibition in 1851, have survived at the V&A and today form an important part of the museum’s Textiles and Fashion Collection. My project culminated in a research trip to the V&A’s Museum of Childhood in Bethnal Green, where the Animal Products Collection was displayed from 1872 following the location’s opening. It was fulfilling to see how small tasks such as uploading photographs, paging through register files, and retrieving objects for research appointments from the storage drawers of Blythe House fit into much larger projects, like Edwina’s upcoming exhibition on the subject of fashion and nature, aimed toward furthering our understanding of the V&A’s vast and varied collections. I am truly grateful the BGC for providing such a worthwhile opportunity and am likewise thankful to everyone I worked with at the V&A, especially Dr. Bill Sherman, for being so supportive, welcoming, and encouraging of my academic interests and continued professional development." 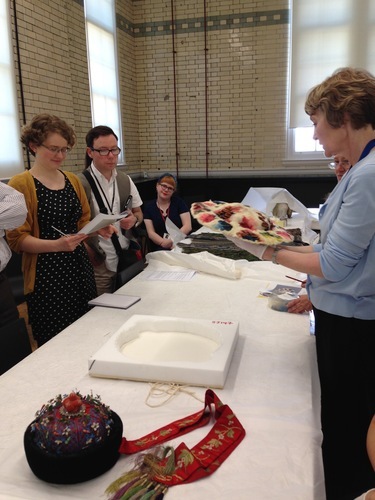 Image one: A study day I assisted with during my placement titled “The Science and Culture of Feathers in Fashion” which was organized by V&A curator Edwina Ehrman in collaboration with the Natural History Museum. Image two:The view from my desk at the V&A.